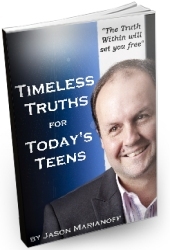 “Thank you for sharing Jason, Love the book, Timeless Truths for Today's Teens. WOW. You incorporate in one book beautifully what's taken me many years of reading? I believe this book is for everyone who wants a better future, not just teens. teenager in your life, I strongly recommend you show or gift this book to them. in our busy lives, but we really need to take time for ourselves and our families. “What can I say except thank you Jason for giving inspiration to our often misled teens. that every parent should read for themselves and share [with] their children. "These key truths are so core to life!! Don't we all need to receive this sort of encouragement?? On reading thru I found myself exclaiming 'Yes! & Yes!' on each heartening principle. these positive, strengthening, confidence inspiring attitudes to those who choose to receive them. How important, empowering and simply key to living an authentic life (regardless of age). Recommendation; off the scale! Get it, digest it, live it!" Click the "book cover" to receive the book!